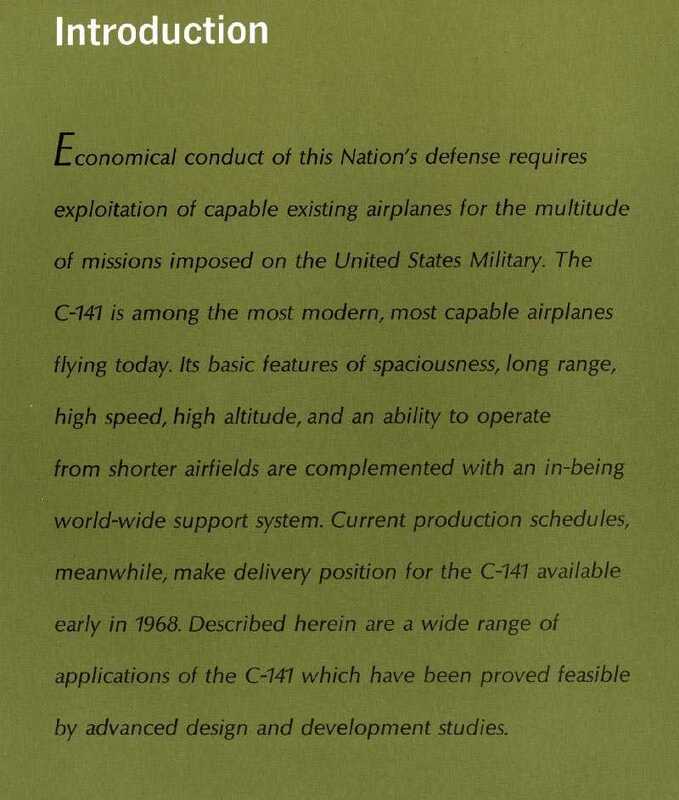 Below you will find a copy of a 32 page brochure that touts the versatility that Lockheed perceived would be attractive to the military. 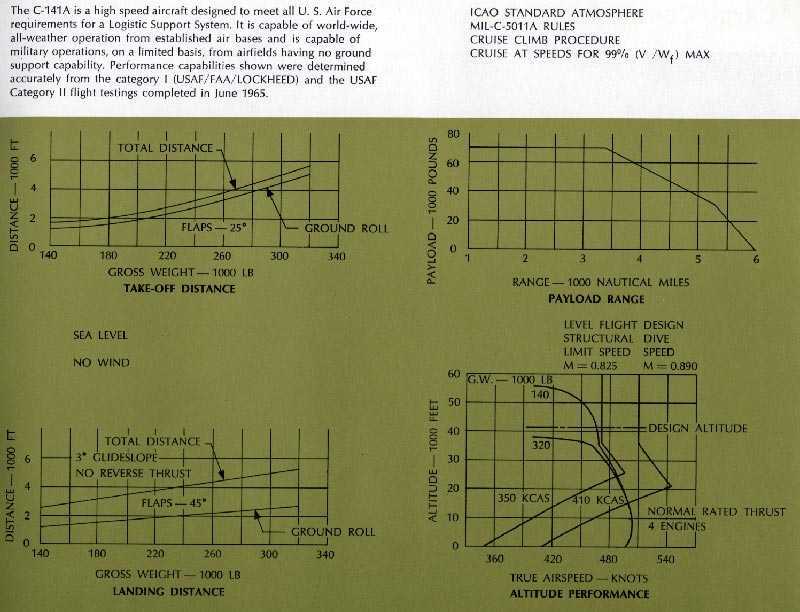 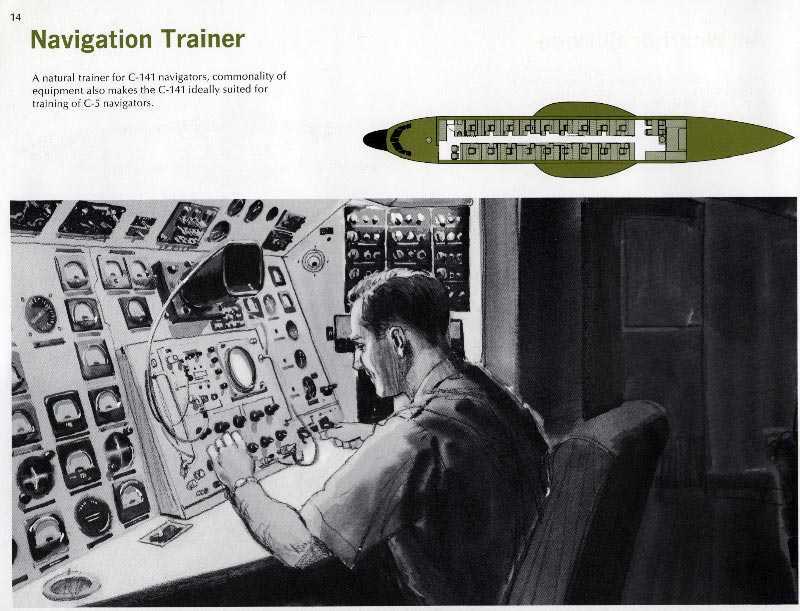 I could find no publication date anywhere on it but appears to have been created in late 1965 or early 1966 based on a reference to flight test data results from June of '65. 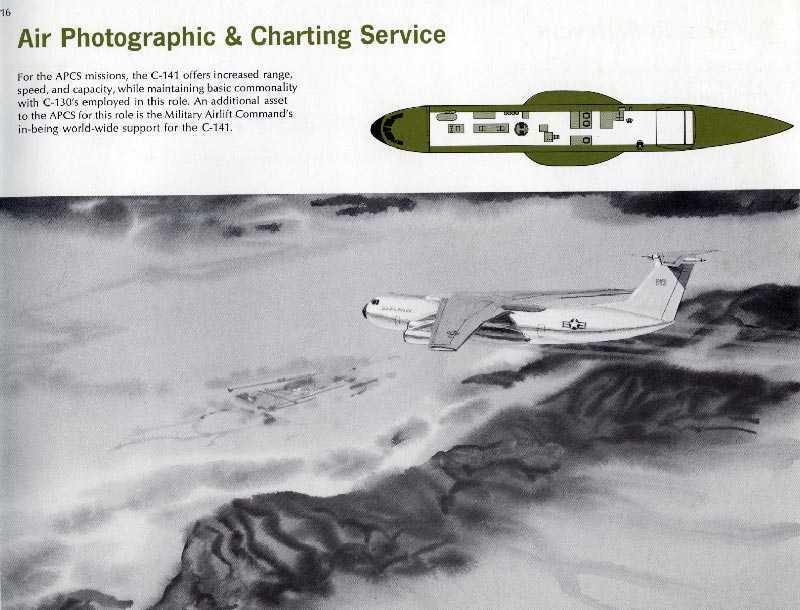 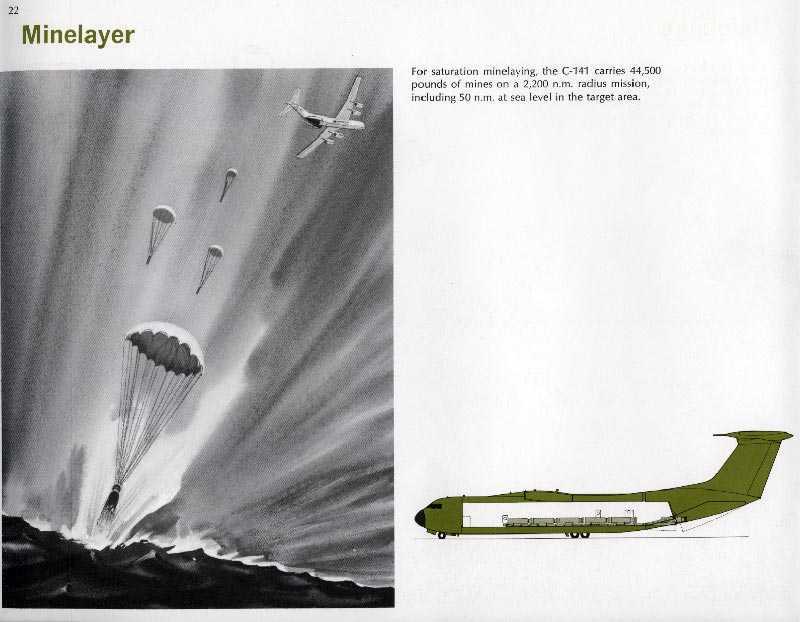 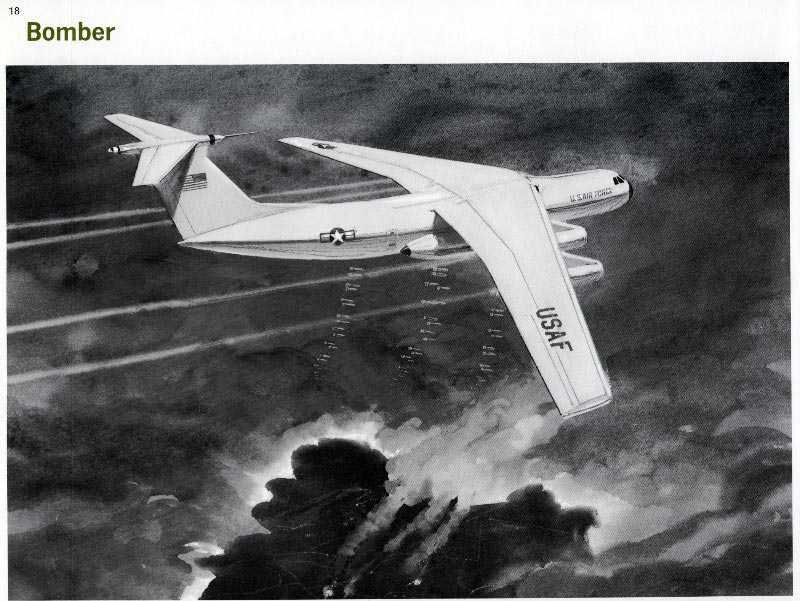 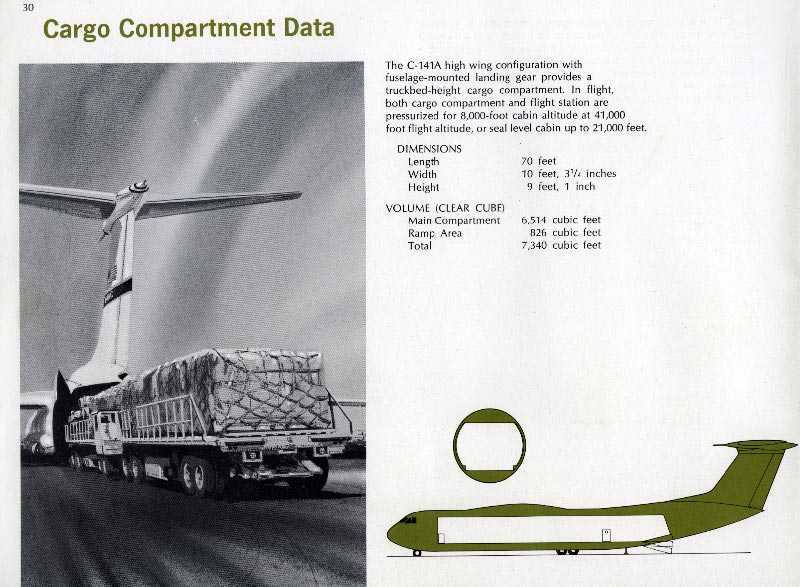 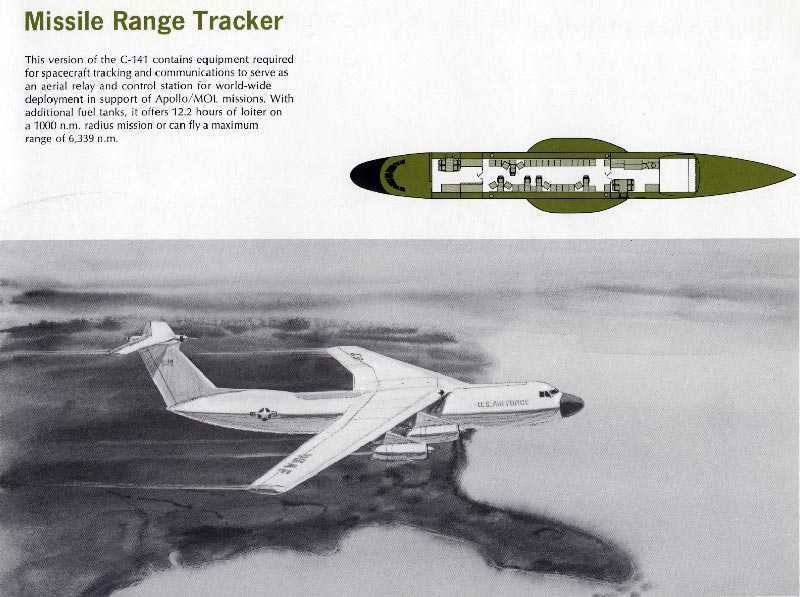 It was contributed to C-141 heaven by George Miller, from his vast collection of C-141 materials. 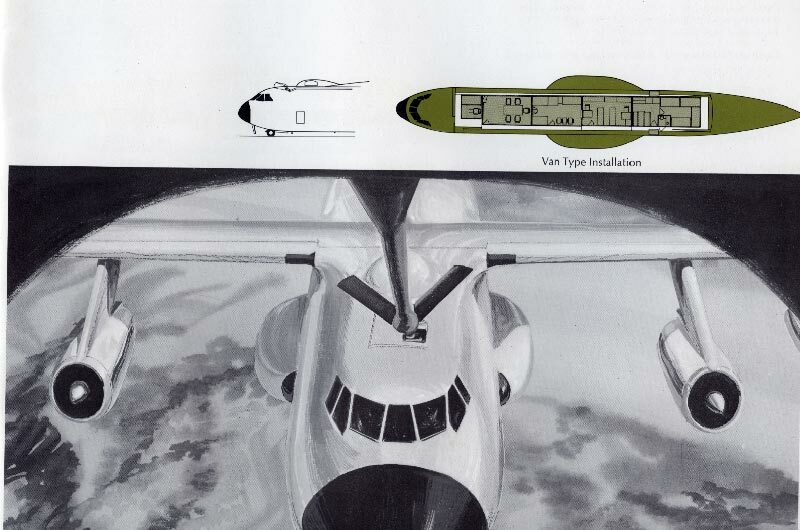 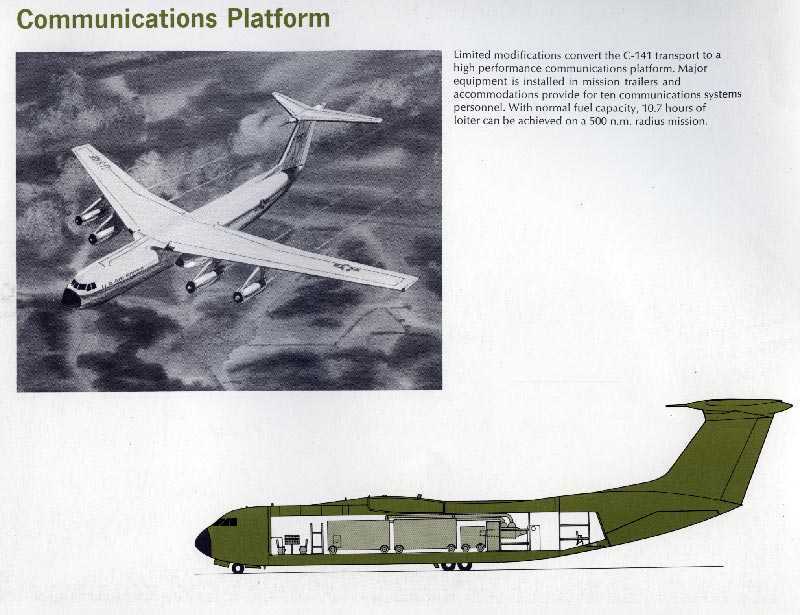 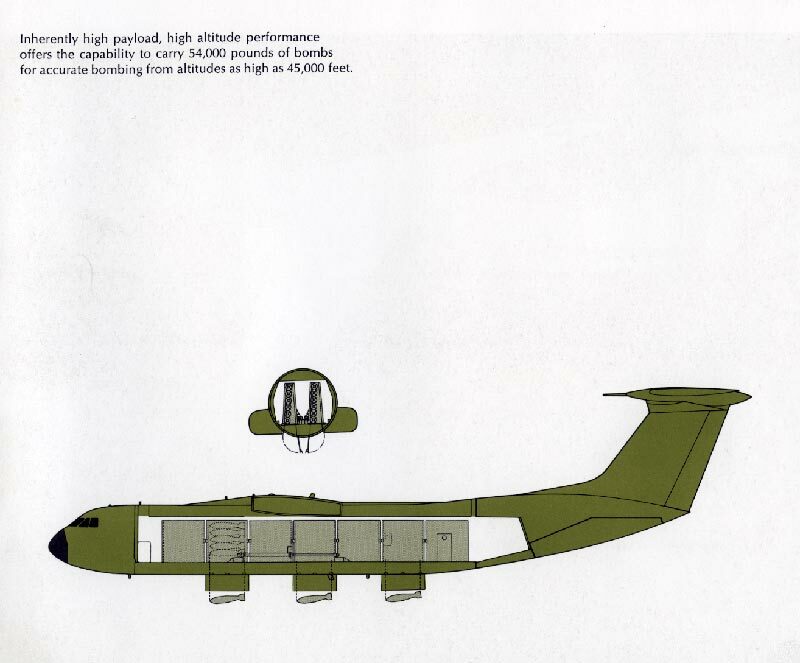 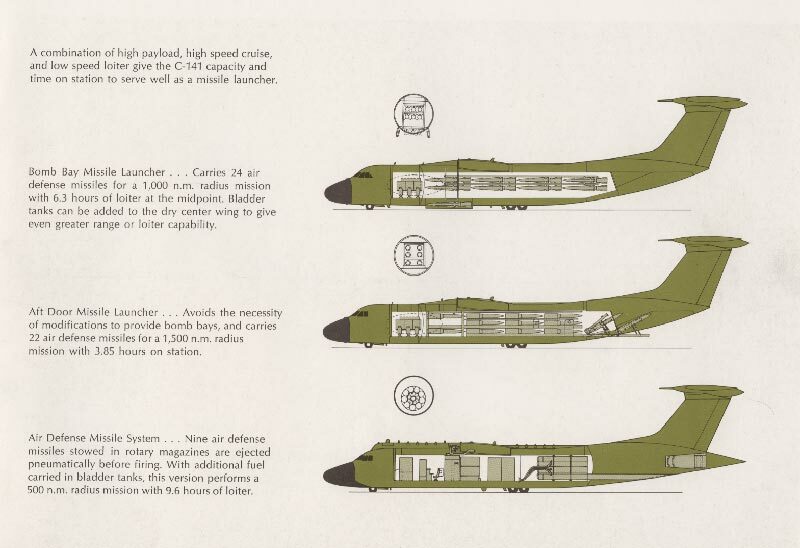 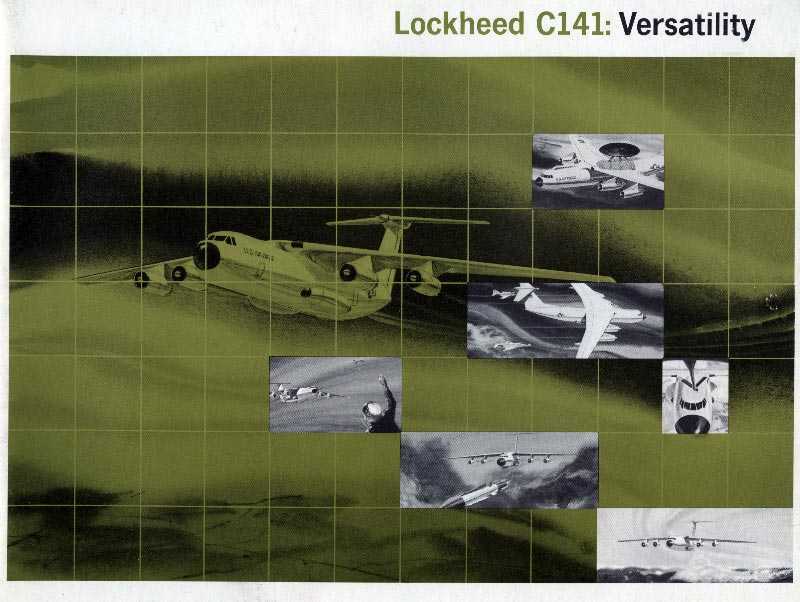 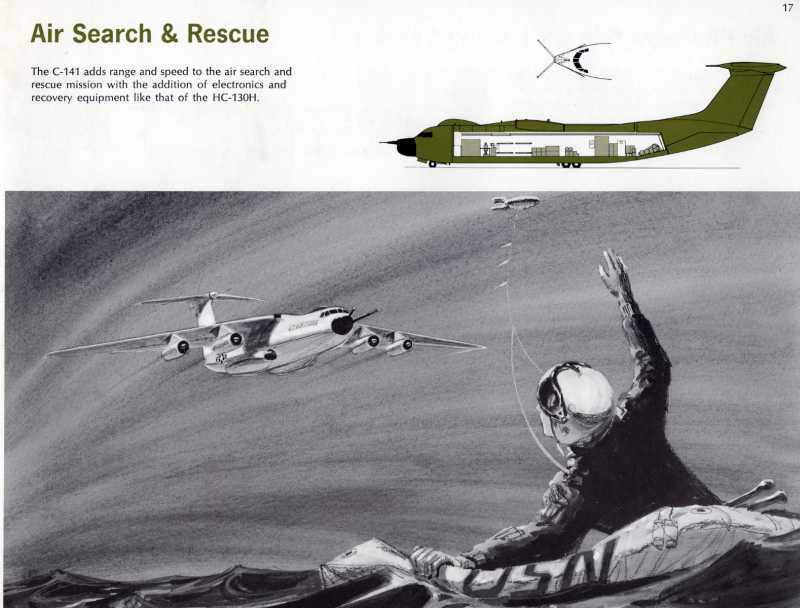 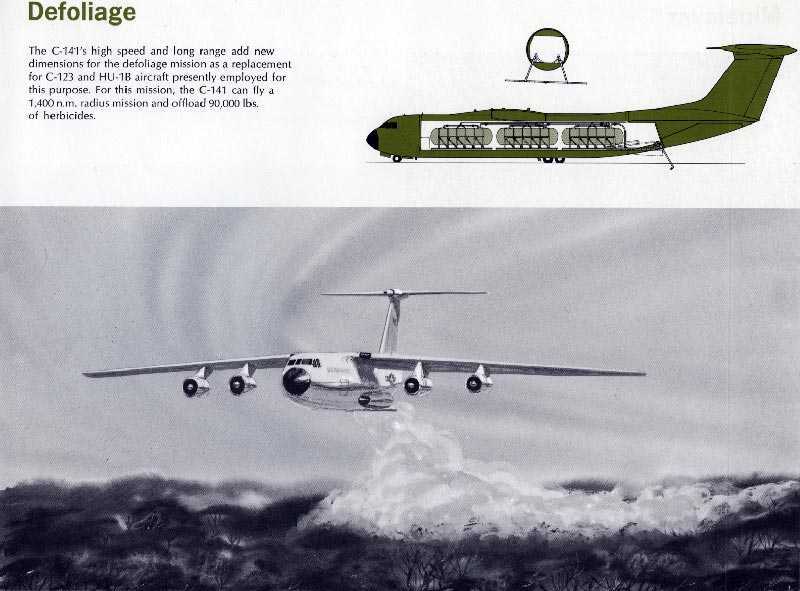 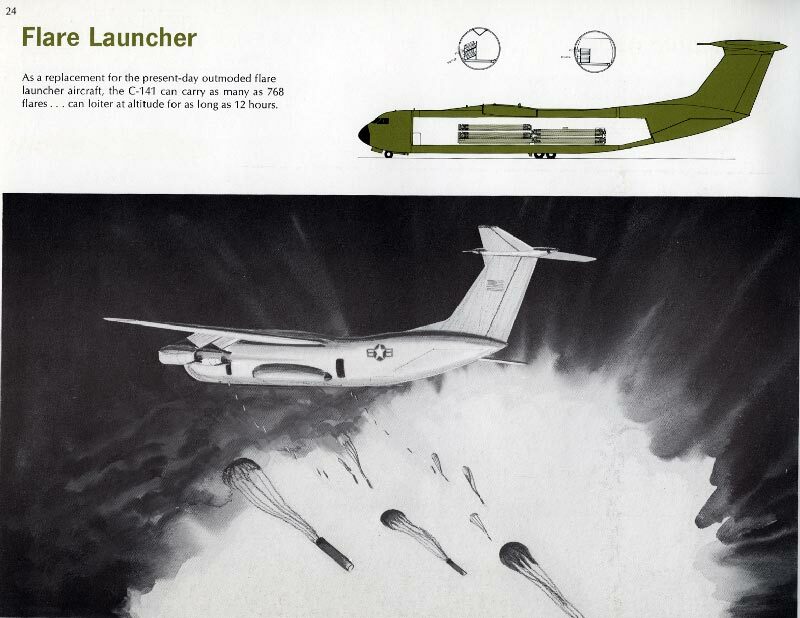 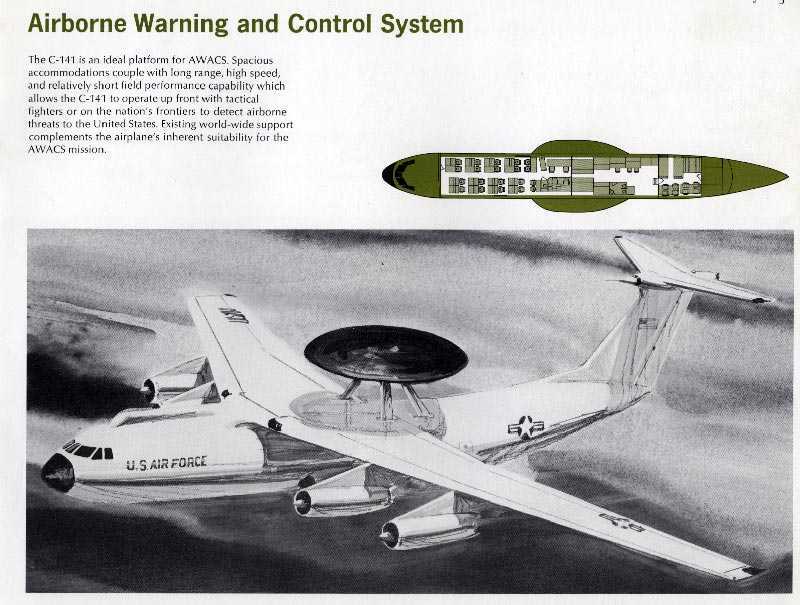 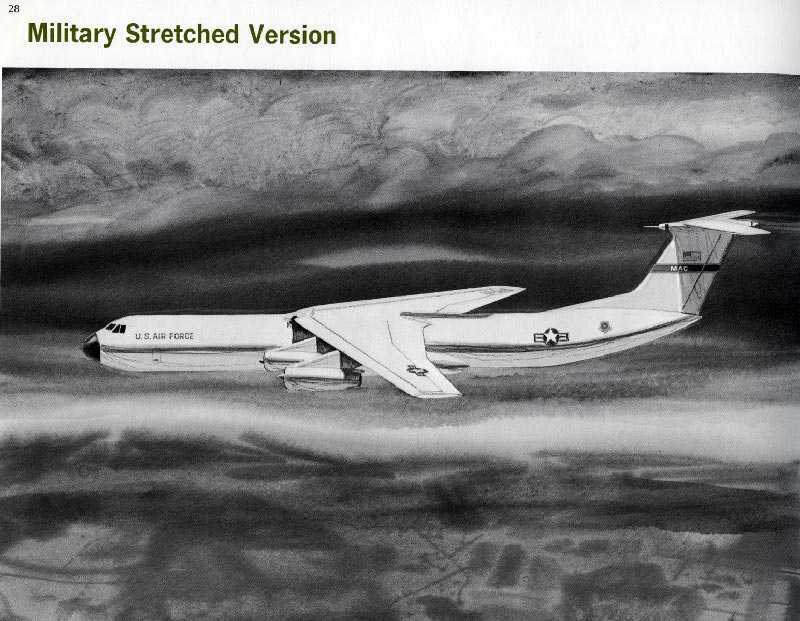 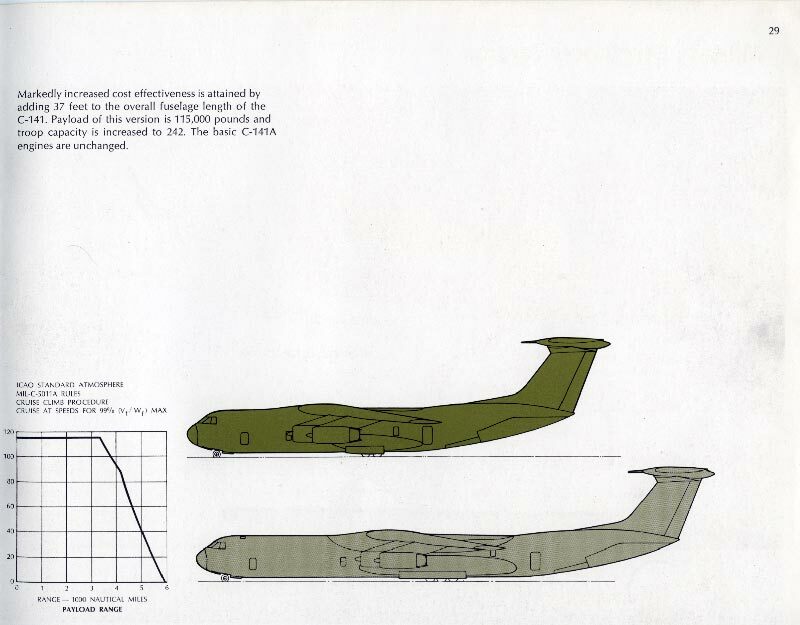 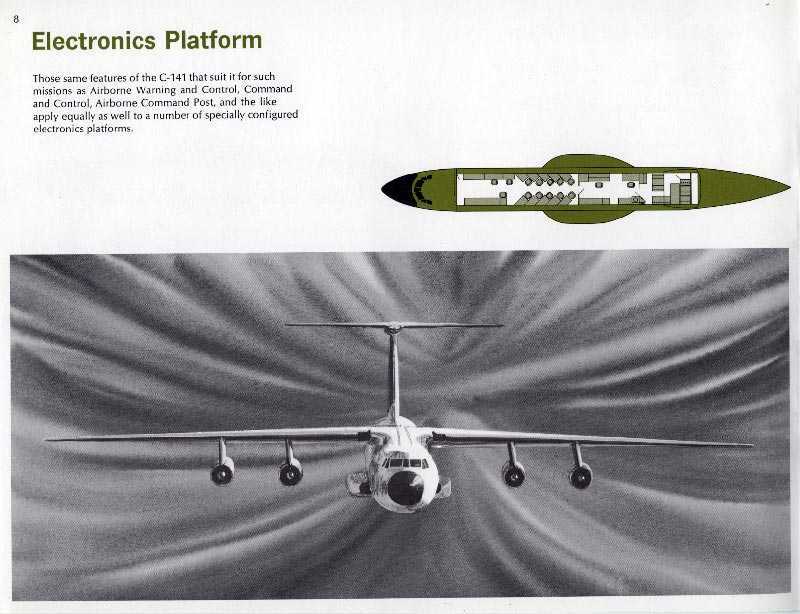 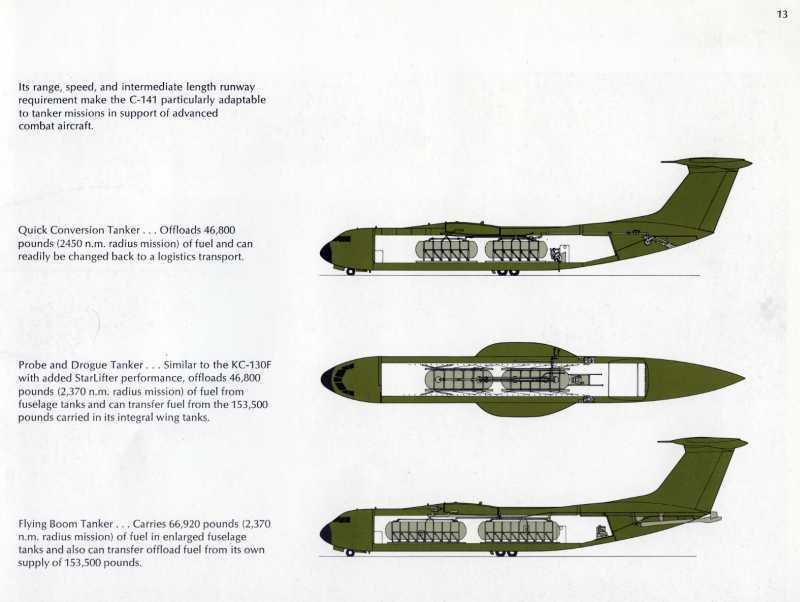 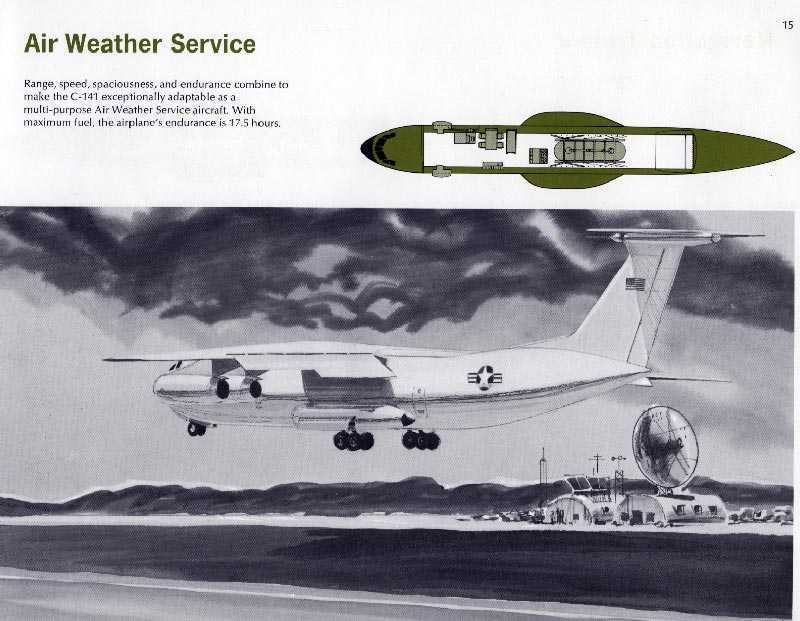 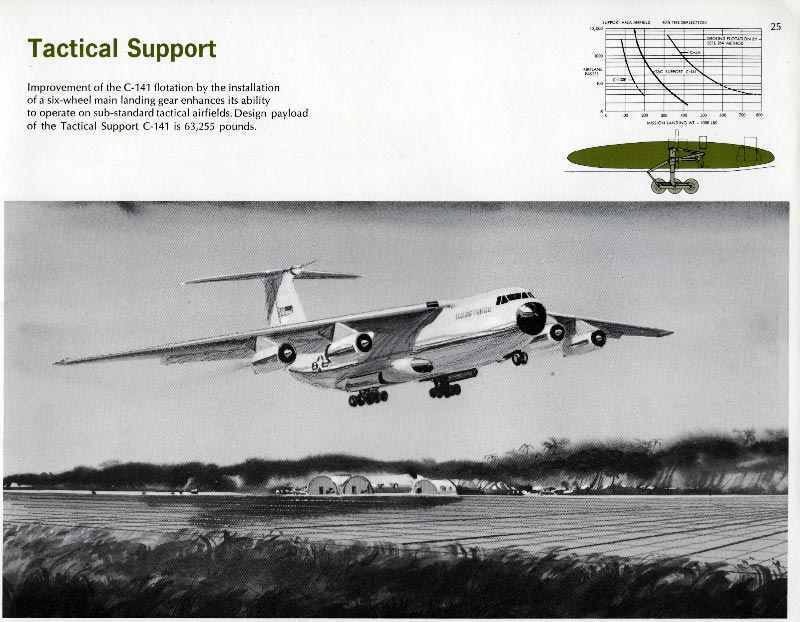 It's interesting to see that even before the C-141 was placed into daily squadron service Lockheed had anticipated numerous of the future enhancements that would be applied to the aircraft, including both the stretch and refueling mods which did not take place for almost two decades after the initial C-141's rolled off the line. 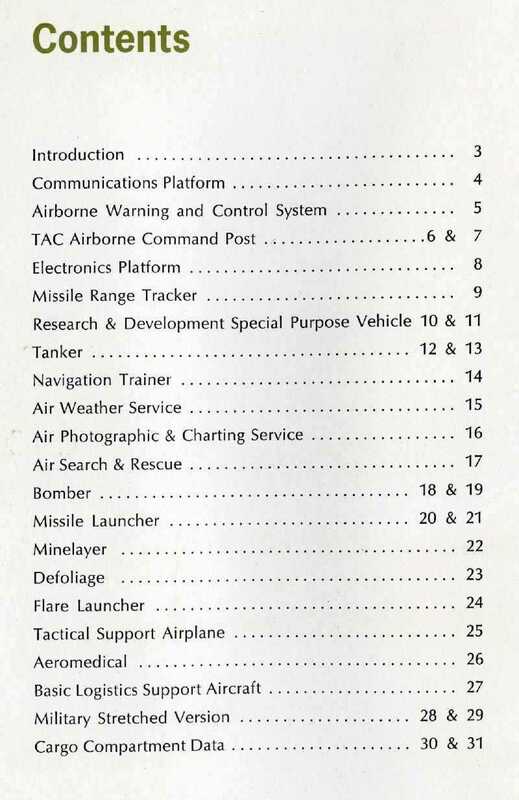 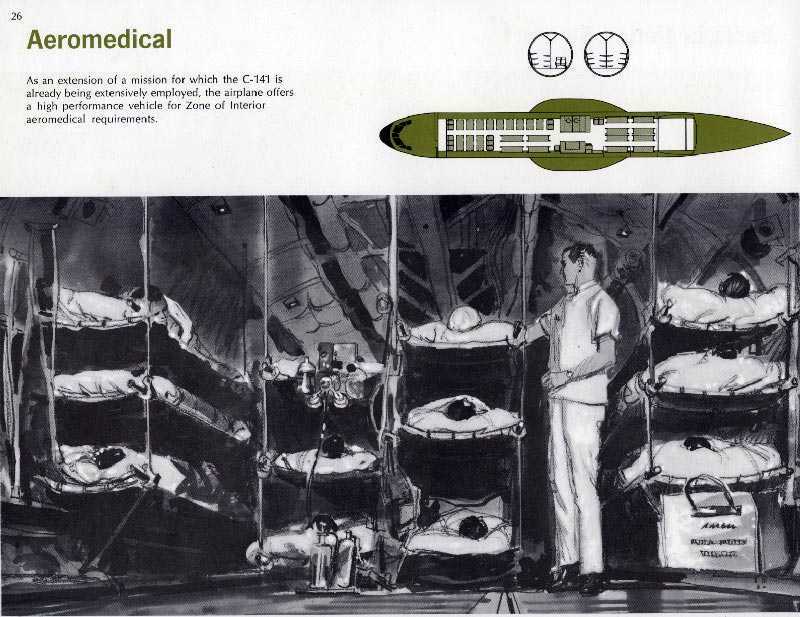 It is also not just a little distressing (for me at least) to note that some of the potential missions Lockheed outlines in this document (for example, defoliation, missile launching, mine laying, and even bombing) are at least in philosophical conflict with the frequent use of the C-141 for medivac, humanitarian, and other relief operations. 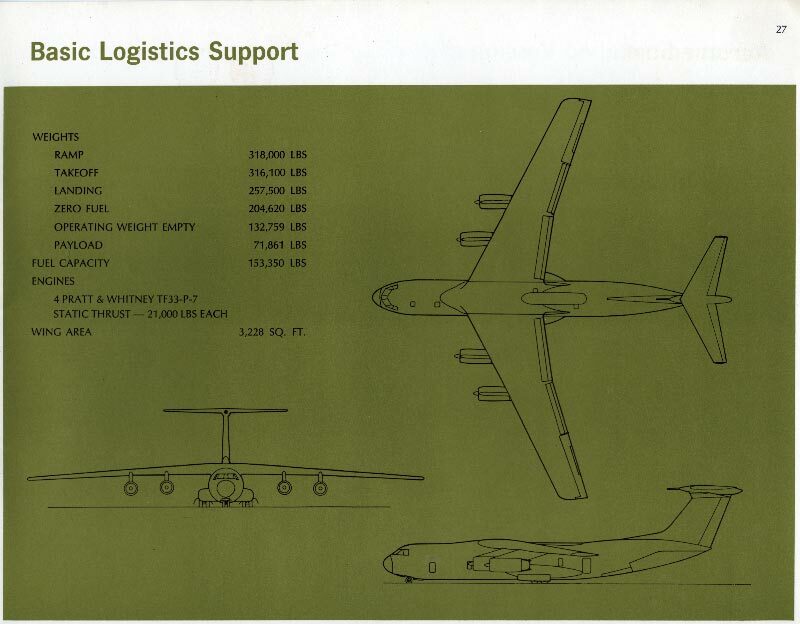 I'd like to think these ideas were late night brainstorming session results rather than serious considerations of potential use of the C-141 by the AF (or other branches of the military). 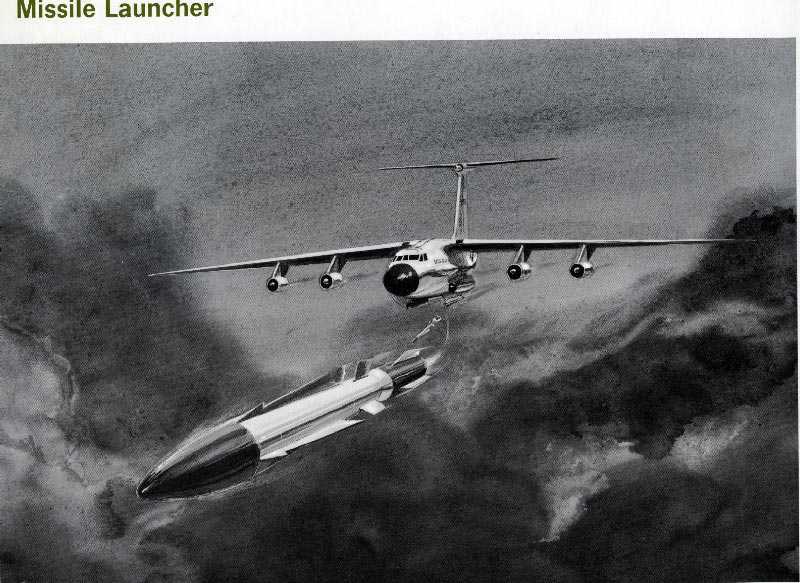 But as the famous John Lennon song goes: "They say I'm a dreamer!". 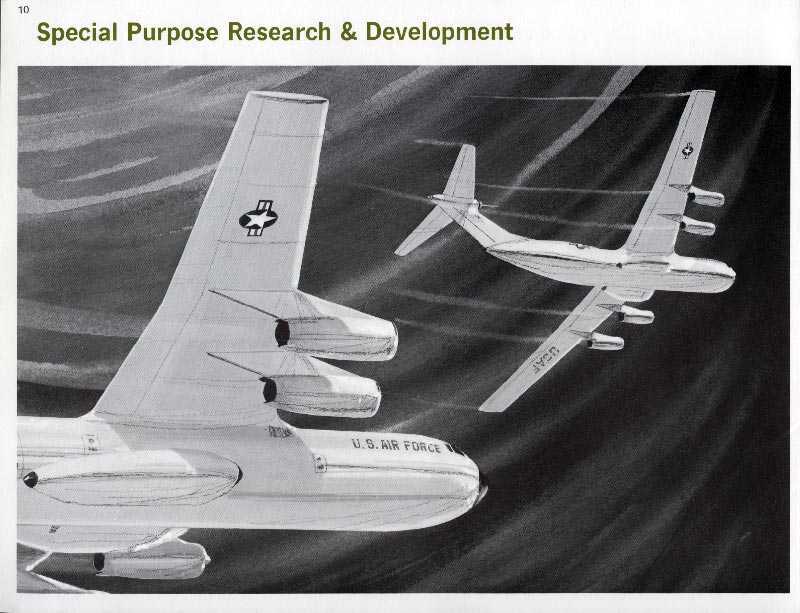 Remember, these were the early 60's and we had Dr. Strangelove and James Bond, and the Rooskies on our minds at the time. 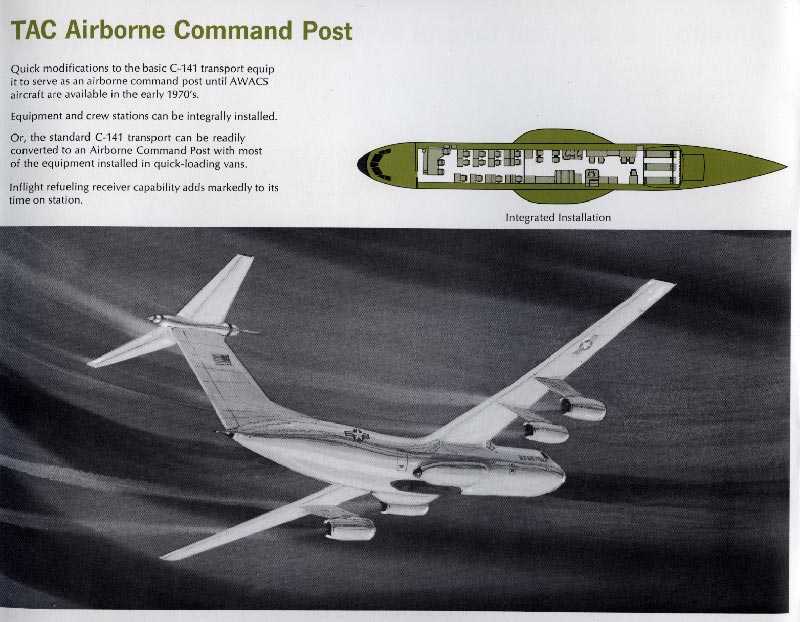 Had these sorts of missions been assigned to the C-141 (forgetting for the moment the SOLL mission) it would have made it hard for any country to feel with 100% certainty that "relief was on the way" when they saw a C-141 coming over the horizon.